You’re probably looking at hundreds of pictures of drum kits and feeling a bit perplexed. If you don’t know what parts make up a drum kit read this guide first. Start off by narrowing down the size of kit you want – 4 piece? 5 piece? How many cymbals do you want? Remember cymbals are not counted in the number of ‘pieces’ of a kit. A 5 -piece kit could have 57 cymbals – it’s still a 5 piece kit. This is all covered in the guide mentioned earlier – if you haven’t read it and understood it you shouldn’t be buying a kit yet! If you’re planning on doing drum exams it’s a good idea to go for a fairly standard 5 piece kit with at least one crash cymbal and one ride cymbal (and of course hi-hats, a stool and everything else that makes up a drum kit). If you have no intention of doing grades you can be a bit more flexible with the set-up and it all essentially boils down to how many toms you want. It’s quite fashionable these days to go for a 4 piece kit with one mounted tom and one floor tom or even a ‘one up, two down’ 5 piece kit with two floor toms. If you really can’t decide play safe for now and go for a ‘two up, one down’ 5- piece – for want of a better term a “standard 5 piece drum kit”. But there really is no standard – it’s not like a violin that *always* has 4 strings. A drum kit can be tailored to suit you – but I would save the tailoring until you know what you’re doing. Also remember you can always expand your cymbal collection over time – start off with hi-hats, a ride cymbal and at least one crash cymbal. You could also go for a combined ‘crash/ride’ cymbal if you want to save space & costs. You’ll notice when hunting for kits the term ‘shell pack’ is often mentioned and there’s a BIG DIFFERENCE between a shell pack and a complete kit so be careful! A shell pack is normally ONLY the toms and bass drum… and nothing else. Sometimes the shell pack will include hardware but generally you have to buy this separately along with a snare drum, cymbals etc. The reason for this is since the toms and bass drum generally all match – i.e. they’re the same colour. The snare drum is interchangeable – in fact it’s fairly rare for the snare drum to match the rest of the kit. So often drummers will buy a shell pack in their chosen colour / wood type and then buy everything else separately. This gives you a bit more flexibility to choose a decent snare drum in the size & material you want. So bear this in mind when you see a cheap shell pack – you still need to shell out (ha ha) for everything else that makes up a drum kit (see below). A ‘complete kit’ normally includes everything you need to get started… apart from sticks. OK, so hopefully you’ve decided on what size kit you want. Next – what brand? Well firstly you need to view drums (shells) and cymbals as entirely separate entities. Generally cymbal manufacturers don’t make drums and drum manufacturers don’t make cymbals. Most of these brands make both budget, entry-level gear AND high end pro-level gear. So it’s all a matter of budget. There are also manufacturers such as CB Drums and Tiger who specifically make budget kits aimed at beginners. Finally there’s the ‘unbranded’ route and this should be viewed as an absolute last resort. In fact, just avoid unbranded gear completely. There’s really no need – you’re much better off picking up a 2nd hand branded piece of gear than a new unbranded piece of junk. The problem with unbranded equipment, apart from quality, is that sizes are often completely non-standard so when you come to upgrade parts of your kit you’ll be stuck. You’ll also find when it comes to finally getting rid of it, and you’ll want to get rid of it, it has very little re-sale value. Stick with brands if at all possible. Completely avoid ‘toy’ drum kits if you actually want your child to really learn drums. Toy drum kits are exactly that – toys and near useless for learning on. If it’s a complete drum kit, brand new, for under £100, it’s a toy… or stolen… or you just dreamed it. 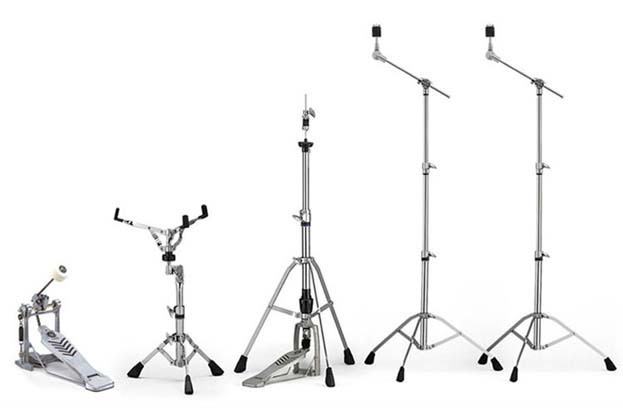 Hardware is all your stuff that isn’t a drum or a cymbal – so things like cymbal stands, pedals, drum throne etc. Most drum kit manufacturers also make hardware but don’t feel compelled to keep everything the same. For example, in my main set-up my drums are made by Pearl… and so is my hi-hat stand. The rest of my stands are Yamaha and my main bass drum pedal is made by Tama… and my stool is Gibraltar. One day I’ll change my hi-hat stand to a Yamaha if the Pearl stand ever breaks, but it’s lasted 20 years so far and still looks new so I’m not expecting to part with it any time soon. The nice thing about decent branded hardware is that it will last you a lifetime if you look after it. Also parts are generally fairly standard sizes and interchangeable (to a degree) – so if something does break it’s relatively easy to replace just the broken part without buying a whole new stand. I’ve got good news and bad news about cymbals. The good news is that the el-cheapo nasty things that came with your first kit will be absolutely fine to learn on. The other bit of good news is that when you come to upgrade your cymbals your new ‘good’ cymbals will last you a lifetime if you look after them. The other bit of good news is that good cymbals can make the biggest difference to the overall sound of a kit. With decent heads and a good tune even a cheap kit can sound pretty good. Bad cymbals will always sound bad. OK… so the not so good news. Decent cymbals are expensive. VERY expensive. You can easily pay upwards of £300 for a pair of hi-hat cymbals alone… and the hi-hats are probably going to be the first cymbals you’ll want to upgrade. Cheap hi-hats can sound really naaaaaaaaaaaasty. BUT all is not lost. Manufacturers such as Diril, Dream and Istanbul Mehmet are putting out some beautiful hand made cymbals at a fraction of the price of equivalent quality metal from the big players. Also look out for second hand cymbals – although good cymbals generally hold their value very well there are often bargains to be had. TOP TIP: Look out for high end cymbals that have been professionally repaired! They’re normally MUCH cheaper and still lovely compared to the horrible unbranded things you get with most new kits. The bottom heads (resonant heads) should be mirror smooth. If some fool has been playing the resonant heads you should replace them with new resonant heads. The amount of times I see pitted reso heads in practice rooms… I despair. Don’t worry about the bass drum heads too much – again, as long as the batter head is relatively flat and undamaged you’ll be fine. Stuff it full of pillows to reduce the volume – also try removing the front head completely (leave the pillows in) – this will also help bring the volume down for practicing. So on a 5 piece kit there are 4 heads you may want to ‘upgrade’ – the batter heads on your snare and toms. Get yourself a nice new set of Evans G1 Coated heads – it will cost you around £40. Drum tuning is a whole separate subject I might do a video about at some point – so make sure you Subsribe to Beginner Drums on YouTube! 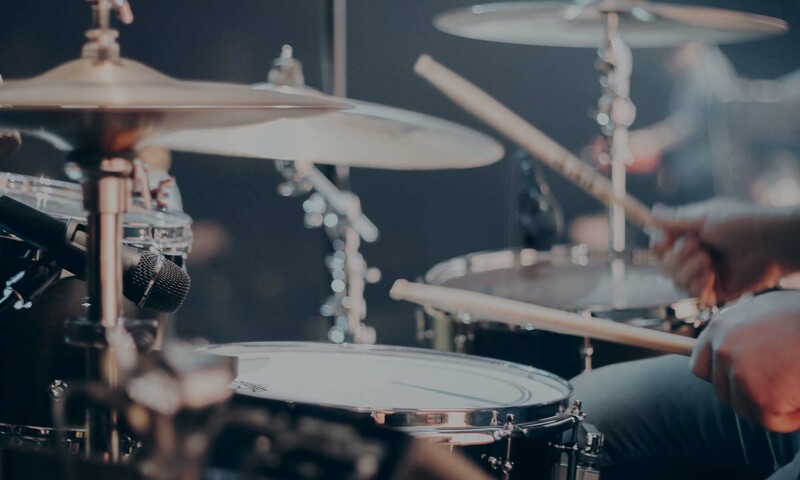 There’s loads of tuning vids out there already but in short – try to keep the tension roughly equal at each lug (so count the turns of your drum key – a couple of turns per lug will normally do) – listen for the note where the drum ‘sings’. In the next article we’ll be looking at a buyers guide for electronic kits. If you’ve enjoyed this please share it on Facebook and Twitter and help spread the word about BeginnerDrums.uk! 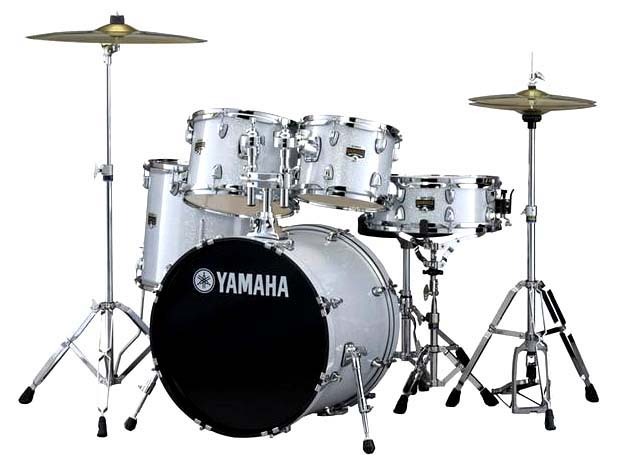 Previous PostPrevious First Drum Kit (part 1) – Acoustic or Electronic Kit?